Skip August 15, 2013 FEATURE STORY, Flies, Slide, Spot No Comments on Feature: If you had only ONE fly . . . If you were stranded on a deserted island with only one fly rod and one fly line – what would you hope they’d be? Probably the most common answer would be a 9-weight with an intermediate sinking line. I agree, a 9-weight with an intermediate line maybe the most versatile outfit made. However, no one ever asks the follow-up question. What fly would you want to throw if you only had one pattern? This is hypothetical – so play along. If you could only fish one pattern, which would it be and why? This is a question that I have thought long and hard about. In fact, over the past three weeks I have driven from Jupiter, Florida to Tampa, Florida approximately six times – so I have had plenty of time to ponder and come to a conviction. For me, that one fly would be the Deceiver, credited to Lefty Kreh. I know most of you are thinking that I’m a die hard Lefty fan, and you’d be right, I am a Lefty fan, but it does not change my answer. Fashioned after the “Inside” and “Outside” fly, as tied by Norman Duncan – became the Deceiver as tied by Lefty Kreh, and made famous by him. Today, the variations on it are uncountable. It’s easy to tie and is a go-to fly – basic bait-fish imitation. I have been tying flies for quite sometime, fly fishing much longer and have personally caught more different species on a Deceiver than any other fly. To name a few species that have taken a Deceiver with gusto are snook, big jacks, albies, yellow fin, king fish, bluefish and, of course, striped bass. To be even more specific in my answer, it would be a number 2 hook – chartreuse and white with white thread and a light amount of flash. 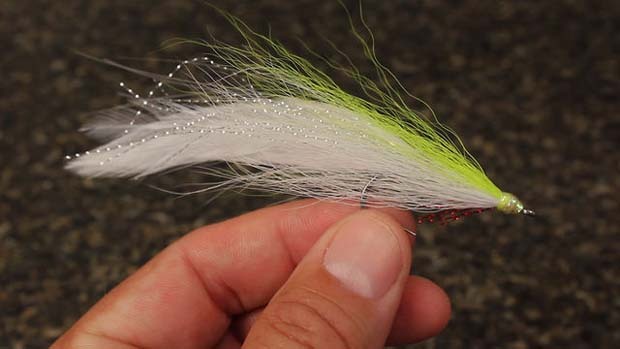 Bob Clouser’s minnow tied in saltwater versions. The variations on this fly are also too numerous to count. Some may think that the Clouser would be the best choice. That’s my number two fly. The Clouser was designed by Bob Clouser and it’s a fantastic fly without question. It is essentially a mini bucktail jig. However, I personally have had my best experiences with the Deceiver. The added weight is less enjoyable for me to cast and can splash down a little hard sometimes. I for one have lumped myself and my motors couling countless times (it has the battle scars to this day). This past weekend I did some very non-scientific testing while fishing with a new client. It was a cloudy overcast day offshore and the seas were flat calm. I was drifting in 180-feet off Singer Island, Florida. I had two outfits set up and rigged. One with a Deceiver the other with a Clouser. Both using the exact same colors and the exact same hook size. I’d cast one rod, then the other to black fin tuna and albies. The Deceiver got hit twice as many takes as the Clouser. Also, the Clouser strikes were subtle and the Deceiver strikes were strong, aggressive, and at times brutal. Of course its quite possible that the fish on this particular day just wanted the Deceiver – that can change and it does change from day to day. That said, I remember having the same results in the past. Over the next few weeks I will be taking two different patterns and matching them head to head – just as I did with the Deceiver and Clouser. What am I trying to prove? Nothing. Its all in good fun and I think many of our readers will enjoy the results. There are enough patterns out there to keep all our fly boxes full for a very long time. But I’m still curious, what would your ONE fly be? Comments are, of course, welcomed.